When it’s time for labor and delivery, the part of the baby that the doctor feels near the birth canal is called the presenting part. It’s the part of the baby’s body that is born first. Most of the time, the baby’s head is the presenting part (vertex presentation). But, in a small number of deliveries, a baby’s bottom or feet are born first. When the buttocks or feet are in a position to come out first, it’s called a breech presentation. Breech presentations are more common in premature births than in full-term births. As a pregnancy continues, it’s more likely the baby will turn, and the head will be down when it's time for delivery. So, as a pregnancy gets closer to term, the chances of a breech birth go down. Before the 28th week of pregnancy, about 20-25 percent of babies are breech. By the 34th week of pregnancy, most babies will turn, and approximately 5-7 percent will be breech. By full-term, only 3-4 percent of babies (3 or 4 out of every 100 births) are breech. A frank breech is the most common breech presentation especially when a baby is born at full term. Of the 3-4 percent of term breech births, babies are in the frank breech position 50-70 percent of the time. A frank breech is when the baby’s bottom is down, but his legs are straight up with his feet near his head. The presenting part is the buttocks. Complete Breech: When a baby is in the complete breech position his bottom is down, but his knees are bent, so his feet are also down near his buttocks. The presenting part is not only the bottom but both feet as well. At delivery, about 10 percent of breech babies are in a complete breech position. Incomplete or Footling Breech: A footling breech is when the baby’s legs are extended and facing straight down. Instead of the bottom, the presenting part is one foot (a single footling) or both feet (a double footling). Approximately 25 percent of breech deliveries are incomplete. As your pregnancy progresses, your doctor will examine you and keep track of your baby’s position. You might even be able to figure where your baby is in your womb on your own. Here are some of the techniques you and your doctor can use to tell which way your baby is facing. You can feel where your baby is kicking you. The baby kicks with his legs, so depending on where you feel the kicks you can judge his general position. If you feel the kicks in your lower pelvis, then the baby hasn’t turned head down yet. But, if the kicks are up toward your ribs and the top of your uterus, then the baby’s head is most likely facing down. 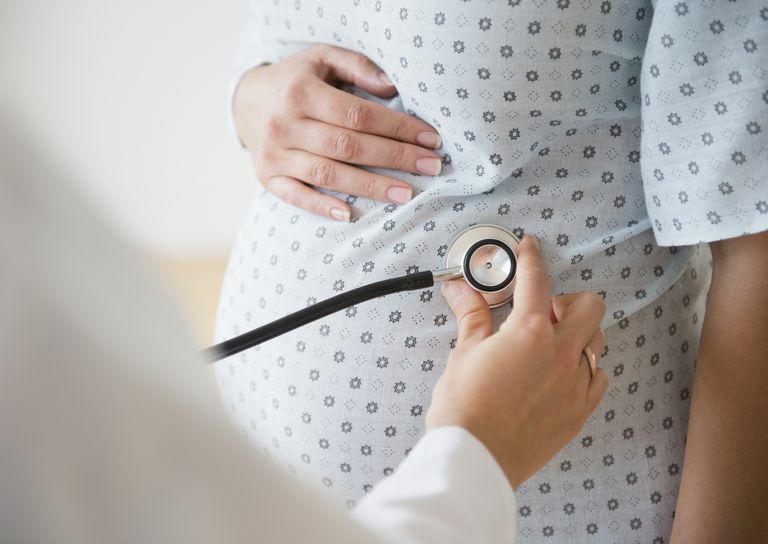 The doctor or nurse who examines you at your prenatal visits will check your baby's position by palpating or feeling your belly to find the baby’s head, back, and bottom. Listening to the baby’s heartbeat is another way to tell where your baby is in your womb. By finding the heartbeat's location, the doctor can get a better idea of the baby’s position. An ultrasound provides the best information. It shows you and your healthcare team a picture of the baby and his exact position in your uterus. If your baby is breech, the ultrasound can determine the type of breech position your baby is in, such as frank or complete. During labor, the doctor can tell if the baby is breech by performing a pelvic examination. She will be able to feel whether the baby’s head or his behind and feet are in the birth canal. A premature baby is smaller and has more room inside the uterus to move around. The most common reason for a breech presentation is prematurity. If you're pregnant with twins or more, the babies have less room in the uterus to move around and get into the head down position for delivery. Uterine issues such as fibroids or a heart shaped uterus can get in the way of the baby’s ability to turn himself. If the umbilical cord is very short, the baby may not be able to move and turn around. Too much amniotic fluid gives the baby the ability to move around freely in the womb. As he grows, he may still be able to flip and turn. Too little amniotic fluid may prevent the baby from moving into the head down position as he gets closer to full-term. When the placenta is low and covers all or part of the cervix, it’s called placenta previa. Since the placenta takes up room at the bottom of the uterus, it makes it difficult for the baby to turn. Some congenital abnormalities can affect the baby’s ability to move into the head down position. These conditions are usually not a surprise at delivery since they are typically seen on ultrasound examination during pregnancy. These are just a few possible causes. Other things are thought to contribute to a breech presentation, as well. Of course, sometimes the reason is not known. Women use a variety of techniques to try to turn their breech babies. From yoga and chiropractic adjustments to music and exercises, there are plenty of things you can do to try to get your baby to move head down for delivery. One of the ways your doctor might help is by performing a procedure called external cephalic version (ECV). If there are no complications in your pregnancy and the baby has not yet turned on his own by the 36th or 37th week, your doctor may attempt to turn the baby using this procedure. ECV works approximately 60 percent of the time. If it is successful, your chances of having a cesarean are much lower. Umbilical Cord Prolapse: During a vaginal breech delivery, there is a chance that the umbilical cord will come down through the cervix before the baby is born. As the baby comes through the birth canal, his body and head can press on the cord and cut off the supply of blood and oxygen that the cord is carrying. It can affect the baby’s heart rate and the flow of oxygen and blood to the baby’s brain. The danger of a prolapsed cord is greater with a footling breech and a complete breech. The risk is less when the baby is in the frank breech position. Head Entrapment: The baby’s head can get stuck during the delivery if the baby’s body is born before the cervix fully dilates. This situation is dangerous since the head can press against the umbilical cord and cause asphyxia or a lack of oxygen. Head entrapment is more common in premature deliveries because the baby’s head is typically bigger than the body. Physical Injuries to the Baby: The risk of injury to the baby is higher when the baby is breech compared to when the baby is not breech. Preemies are more likely to injure their head and skull. Bruising, broken bones, and dislocated joints can also occur depending on the baby's position during birth. Physical Injuries to Mom: The vaginal delivery of a breech baby can include an episiotomy and the use of forceps which can cause injury to the genital area. Breech presentation is one of the reasons for a cesarean section. A cesarean is a surgery with anesthesia. Besides the surgical incision, a mom may experience pain, infection, bleeding, or other complications. The baby is at least 36 weeks. The baby is not too big or too small. You have delivered vaginally before. The size of your pelvis is large enough. The baby’s head is in the right position (flexed). The healthcare team has experience with breech deliveries. There is continuous monitoring of the baby. If any complications arise during the delivery, you may still need an emergency c-section. Whenever possible, the standard choice is to deliver any breech baby who is premature or in distress through a cesarean section. And, since vaginal deliveries, even when all the above criteria are met, come with a higher risk of a difficult birth and birth injuries, most doctors prefer to deliver all breech presentations by c-section. Bergenhenegouwen LA, Meertens LJ, Schaaf J, Nijhuis JG, Mol BW, Kok M, Scheepers HC. Vaginal delivery versus caesarean section in preterm breech delivery: a systematic review. European Journal of Obstetrics & Gynecology and Reproductive Biology. 2014 Jan 31;172:1-6. Cammu H, Dony N, Martens G, Colman R. Common determinants of breech presentation at birth in singletons: a population-based study. European Journal of Obstetrics & Gynecology and Reproductive Biology. 2014 Jun 30;177:106-9. Johnson CT, Hallock JL, Bienstock JL, Fox HE, Wallach EE, editors. The Johns Hopkins Manual of Gynecology and Obstetrics. Wolters Kluwer; 2015. Hofmeyr GJ, Kulier R. External cephalic version for breech presentation at term. Cochrane Database Syst Rev. 2012 Jan 1;10(10). Karning RK, Bhanu BT. Mode of delivery and outcome of breech presentation: a prospective observational study in a tertiary centre. International Journal of Reproduction, Contraception, Obstetrics and Gynecology. 2017 Jul 26;6(8):3409-13. Is It Possible to Turn a Breech Baby Before Labor?